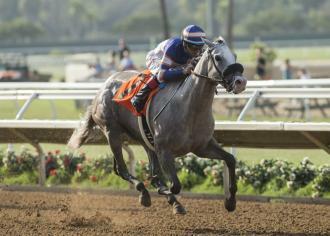 DEL MAR, Calif. (July 29, 2018)–Just Grazed Me stepped up from a debut win against maidens into stakes company and proved more than worthy of the assignment, as she rolled to a 3 1/2-length victory on Sunday at Del Mar in the $150,345 Fleet Treat Stakes for 3-year-old fillies. Both wins came against California-breds, and in both races Just Grazed Me drew the advantageous outside post in small sprint fields. Starting from post 7 in the seven-furlong race Sunday, Just Grazed Me ($8.40) raced in fifth place during the run down the backstretch, launched a sustained move in the four path on the far turn, and kept on motoring down the lane under jockey Tyler Baze. Baze picked up the mount because jockey Joe Talamo, who rode Just Grazed Me first time out at Santa Anita on June 24, opted for Spiced Perfection, the 5-2 favorite. She finished fourth. Show It N Moe It finished second, 3 1/4 lengths in front of third-place One Fast Broad, then came, in order, Spiced Perfection, Impecunious, Kimberlea K, and Loving Lynda. Donut Girl was scratched. Just Grazed Me completed seven furlongs on the fast main track in 1:23.60. Just Grazed Me, by Grazen, did not make first her start until June of her 3-year-old year owing to shin problems at age 2. “We took our time,” D’Amato said. Just Grazed Me earned $85,500 for her Fleet Treat win and now has career earnings of more than $120,000.